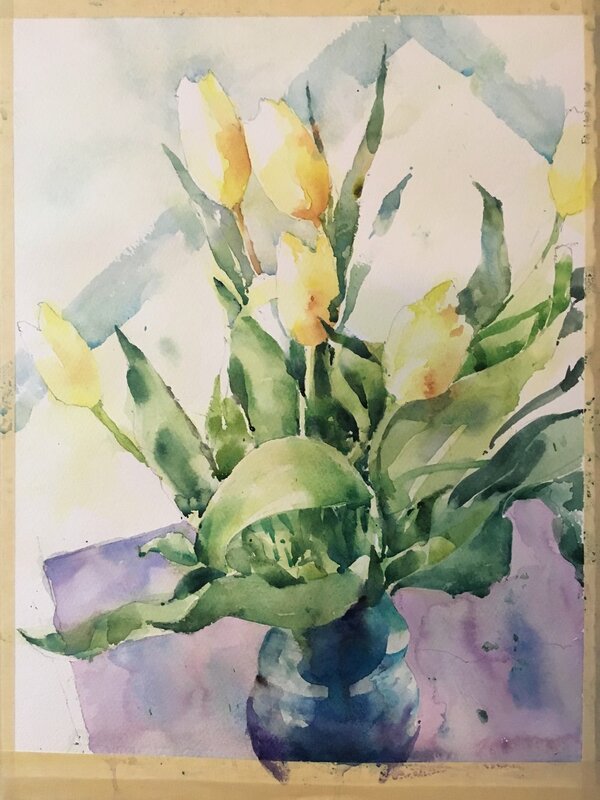 Another go at the tulips. Greens are always tricky so I calmed them down quite a bit on this one. Somehow this one got away from me. All went well until I tried to beef up the background to make the flowers pop and it lost something. Lots I like in here though - the lushness of the foliage and the delicate yellows of the flowers. And especially that wonderful blue on the vase. This was intended for a show and I think I’ll have to give it another shot. Many thanks to Elizabeth Leake for her kind permission to use her photo. After the stress of completing and submitting a show piece with only hours to go I relaxed with a robin. Actually it was quite stressful. Birds like robins with oval bodies and stumpy beaks can be tricky to paint with character. Half way through it was almost a bust but managed to salvage something in the end. This year is the year of entering into shows. I’ve got 3 submissions in already and one has already been accepted. The deadline for the New England Watercolor Society was today and I’ve been procrastinating. Part of the reason is that this is one of the more prestigious shows and I’ve been in two minds about submitting anything. I’ve also been undecided as to what kind of picture to submit. Having visited some shows over the past 6 months the pieces that get accepted have a certain ‘showiness’ to them. This isn’t something that comes easy to me as I either prefer the quiet subtle scenes or the very loose moment in time scenes. But in the end I plumped for this scene of Mt Auburn St in Cambridge. I’ve had a few goes at this before with varying results but have never quite nailed it. This one is almost there and I bit the bullet and submitted. We will see how it does. 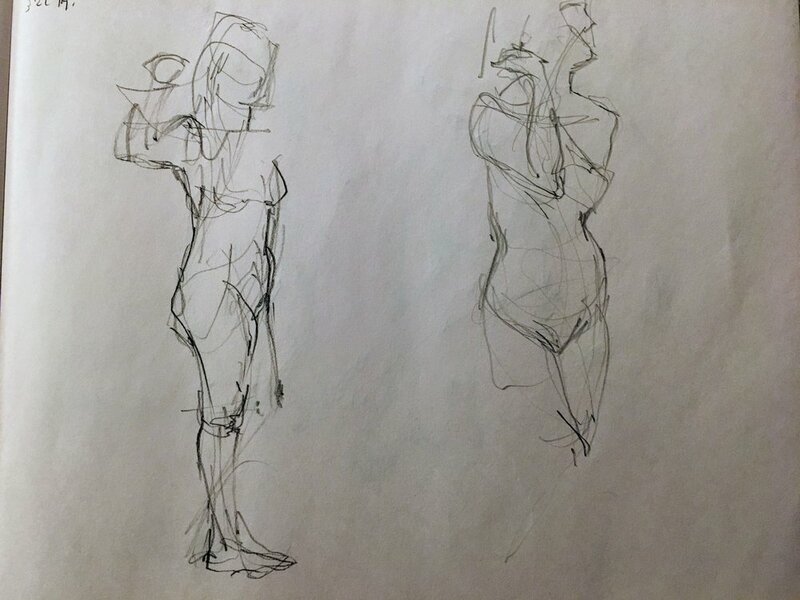 Life Class Drawing. Michele Clamp. Conte pencil on newsprint. The last life class was a little frustrating. The pencil didn’t move quite how I wanted and the outcome wasn’t as successful as I’d hoped. This time was different and I felt everything was going really well. When I came to look again at the results this morning, however, I had a bit of a shock. Someone had come in overnight and replaced my beautifully nuanced gestural drawing with a set of badly proportioned, overworked, scribbles. So it goes. Sometimes it happens. Let’s see some evidence. Just loosening up really. Our model was really great. Some really good poses and the way she varied her head angle really added interest. Next some fives and 10s. this one I think was the best page of the night even though they’re only a 5 and a 10 minute pose. 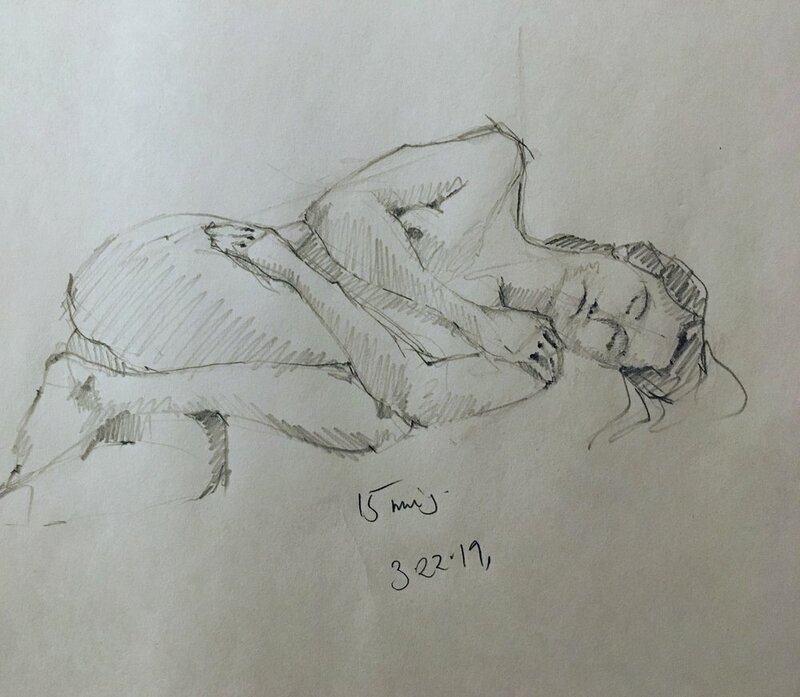 Life drawing. Michele Clamp. Conte pencil on newsprint. There’s some nice nuance in the lines here and flow to the poses. Even the hands and feet aren’t too shabby. Some more 5 and 10s. Next a couple of 15s. Ok I suppose. As you can see I’m failing completely to capture any sense of a likeness in the face. They all look like completely different people. This one has the best sense of the balance of the pose and the light. The hands are dealt with sparsely but descriptively. Yes - happy with this one. And the final, long pose of the night. At the time I was very pleased with this but sadly disappointed when I came back to it. And finally our glorious leader Andrew Cefalu. Terrible likeness again but the drawing has some life to it. Something sleek with dramatic darks and whites. I’m finding it less satisfying to paint small these days. I’m feeling the need for larger areas with broader brushstrokes and interesting color variations. But this small one is pretty good nonetheless. A test run of a Harvard Yard scene I’ve had on the list for a while. Not bad but not there yet. Today somehow was owl day. I wanted to try something a little different and see if I could introduce a background successfully. I wanted to put color in but have a lot of interest in the largely uniform grass region. I think I’m pretty happy. The owl itself came out well and the whole thing has a liveliness and sense of the windy day it was. The gloved arm is James - we were in England and had a great time flying owls at Leeds Castle. Portland head lighthouse. Michele Clamp. Watercolor. 13”x19”. 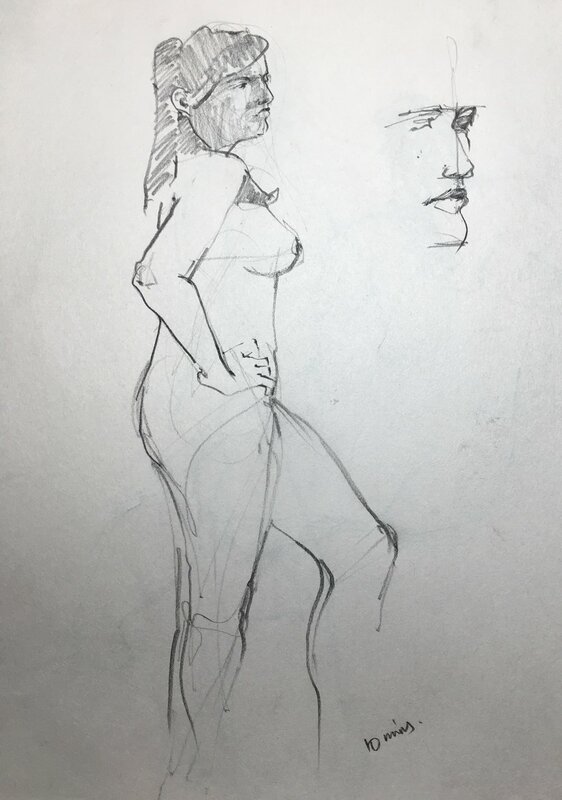 Life class yesterday with Andrew Cefalu. Always a good time even though I find it exhausting. We also had home made cookies which I shall remember to stay a long distance from next time. I took the watercolors along but didn’t use them in the end. I didn’t really get into the flow and everything was a little stodgy. Adding watercolor to the mix would have ended in tears and nobody wants that. We started with some 2 minute gestures. I felt pretty good at this stage. The pencil was moving well and my arm felt free. Also our model was superb and did some wonderfully interesting poses. Next onto 10 minute sketches. These were ok apart from two disastrous attempts at the foreshortened pose. Looking back at these this morning they don’t seem too bad but I had come away disatisified at the end of the session. Too much focus on the face in most cases and some frankly embarrassing feet were in evidence. I will definitely be back in two weeks hopefully with some serious hand and foot practice under my belt.